Walking through the commercial area of Davenport's Hilltop Campus Village last month, Scott Tunnicliff picked up trash. The garbage far outstripped his ability to carry it - two hands and a few pockets - but Tunnicliff persisted. Similarly, the Hilltop Campus Village organization (of which Tunnicliff is director) has over the past three years spiffed up its neighborhood in lots of little ways that seem mostly cosmetic: crosswalks, banners, and decorative streetlights. There are nine new streetlights on Harrison and 16th streets (installed in the past two years and funded by grants), and they and the crosswalks do serve a safety purpose, designed to make the area more pedestrian-friendly. But these improvements, along with 50 banners on Harrison and Brady streets, are nonetheless modest changes. Still, said Kelly Wallace - owner of the two-year-old Estate Sale Shop in the old McKay Music building at 1326 Brady Street - they hint at renewal. "The little amenities that we're seeing make a big difference," she said. "That type of visual as people drive through gives the impression that it is something that's being revitalized. Many times, it starts with a flower pot full of beautiful flowers." It's been more than flowers, though. The Hilltop Campus Village, for example, has hosted two music festivals. McButt's Neighborhood Bar (at 1516 Harrison Street) has had extensive renovations, and Greatest Grains (at 1600 Harrison Street) has undergone some restoration of its façade and windows. In the three-plus years since the organization was formed - and since the area was designated a Main Street Iowa "urban-neighborhood district" - the Hilltop has become "a far more inviting environment," Tunnicliff said. And it's already paying dividends: "We're seeing more people having buildings professionally listed. We're seeing more traffic from potential investors. We're seeing more interest from people who are looking to locate a small business here." 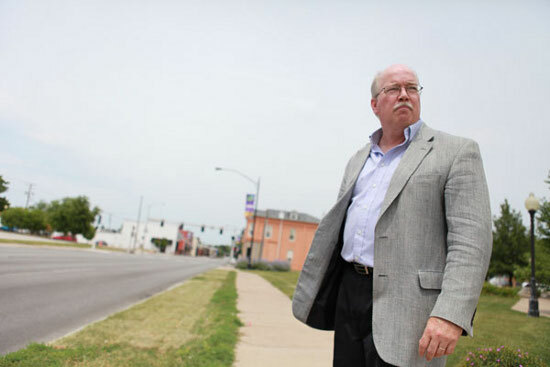 Tunnicliff said he sees the Harrison- and Brady-street corridors developing into a sort of campustown for the Palmer College of Chiropractic and St. Ambrose University, with a diversity of businesses not seen in the area in the past 50 years. The opportunity for the Hilltop, wrote DeAnn Soults - the former president of the organization whose term ended in June, and who is also president of Crescent Cleaners - is to strengthen the area as an entrance to, connection to, and expansion of Davenport's downtown. But her long-term vision is a distinct and independent neighborhood: "I see lots of small shopping and service businesses, some even started from incubation of students through college programs - no need to drive all the way out to the outskirts of town for anything. Lots of trees, bushes, and flowers line both Harrison and Brady outside all these walkable shops. Bicycles stopping and going up and down to the river. Lots of families living close by without much need of any car because everything is so close!" Statistics collected over the past three years by the Hilltop Campus Village say that in a sluggish economy, the Hilltop Campus Village is growing - with a net gain of four business starts and two jobs, 75 building rehabilitations (from minor to major) involving $6 million in private investment, 34 building sales and transfers representing almost $9.5 million in private investment, and more than 14,000 volunteer hours. Tunnicliff said he didn't have comparable statistics for previous years to which to compare those, and he acknowledged that it's impossible to know what would have happened without the Hilltop Village Campus effort. Aldi, for example, likely would have expanded its store anyway, he said. But, he added, "eyeball level, you have to say it's been an increase - both private sector and public sector." And bigger changes could be coming soon. The proposed 60-apartment Harrison Lofts project - between 14th and 15th streets - is moving forward. According to Jackie Nickolaus, vice president of development for Minneapolis-based Sherman Associates, the company plans to secure financing for and begin construction on the $7.9-million development in the fall, with units ready for occupancy in summer 2013. Parking remains a concern for some nearby residents - with only 30 on-site spots presently planned - but Nickolaus said her company has identified the potential for roughly 80 additional nearby parking spots that could be available for tenant lease. "That is one that could be a real positive game-changer," Tunnicliff said, noting a multi-million-dollar investment in "a block that's presently vacant. That can change the whole complexion." But the Harrison Lofts also show that the complexion has already changed. "It's always great to go and work in a neighborhood where the city, the neighborhood, and the business community are committed to redevelopment of the area," said Nickolaus, whose company was invited by the city to craft a proposal for the property. "We don't ever feel like we need to be the last one in; we like to be at the starting end of redevelopment. But we like to know that there is neighborhood and city commitment to the redevelopment of an area." That commitment is clear in the Hilltop Campus Village's funding. The organization has an annual budget of nearly $70,000, Tunnicliff said, and the City of Davenport, St. Ambrose University, the Palmer College of Chiropractic, and the Hilltop Business Association have provided significant startup and operations donations - $10,000 or more each year. When asked about the most encouraging aspect of the Hilltop Campus Village effort, Ron Frantz - the owner of multiple commercial and residential properties in the area (including McButt's) - initially said the Harrison Lofts. But then he added the "wonderful and surprising" participation of St. Ambrose, Palmer, and Davenport. "That's the power of the machine," Wallace said of the coordinated effort. "You don't have as big a contingent of people who are interested in redeveloping a historic district ... as you do in this one and fail at it. It takes time, and it takes people who are willing to give it a try and believe in it." Tunnicliff said the private and public investments feed off each other. 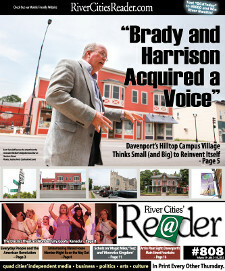 The city sees a unified push by a variety of Hilltop interests - "Brady and Harrison acquired a voice," he said - and is more willing to invest its money in the area; Hilltop stakeholders see the city as a partner in their efforts. "It's always easier to justify an investment when you see that it's going to be appreciated, and when you see that it's being leveraged with other resources," he said. "There's just a lot of people who get it, and understand that if this is successful, it's going to benefit everybody," he added. That cooperation was evident in a May workshop for realtors designed to showcase Davenport's south-of-Locust area, including the Hilltop Campus Village and the Gold Coast residential neighborhood. Tunnicliff said the event drew 56 licensed realtors. But for all the positive signs, the Hilltop Campus Village - like any redevelopment effort - has challenges big and small. Frantz said there's significant neighborhood opposition to any gentrification, for example. And the departures in the past year-plus of the Harrison Hilltop Theatre (to the District of Rock Island) and the SiS International Shop (to downtown Davenport) can be viewed as setbacks, although Tunnicliff noted that turnover is typical in any commercial area. Yet to reach its full potential, the Hilltop Campus Village will need to overcome two major roadblocks - with one barrier involving two actual roads: the speedways of Harrison and Brady streets. Without even being asked about it, Nickolaus offered that "the traffic moves so quickly no one can stop and enjoy the neighborhood." And everybody else interviewed for this article said changing the nature of Harrison and Brady streets is critical to the revitalization of the Hilltop Campus Village. Fundamentally, they said, it will be difficult to make the neighborhood a destination if it remains a blur to passing motorists. And perhaps even more challenging will be changing perceptions about the Hilltop area that are based on decades of decline. The Hilltop Campus Village is bound by Lombard Street on the north, Perry Street on the east, Fifth Street on the south, and Ripley to the west - with a jog to Gaines from 17th to Lombard streets to encompass St. Ambrose. It has several advantages over many downtown-renewal efforts. It has stable and strong anchors in Palmer and St. Ambrose. It already has a residential base, and as a result has many amenities downtown districts struggle to attract: gas stations, two drugstores, and a grocery store. Brady Street has a number of churches that have been involved in the revitalization effort. The Davenport Community School District's headquarters are in the Hilltop Campus Village, as is Central High School. With the volume of educational institutions and churches, Frantz said, he wondered: "Why the hell's there even a problem?" What the area lacked, Soults wrote, was "this structure and synergy." Improvements might be made to one property, but they were merely improvements to one property. The organization, she said, "fosters massive amounts of incremental changes to happen again and again and again." A board was created in June 2009, its application to be a Main Street Iowa district was approved, and Tunnicliff was hired as director in August of that year. It's important to note that a Main Street Iowa designation is not a ticket to government funding. As Terry Poe Buschkamp, a district specialist with the state program, explained, Main Street is "really just teaching a process." That involves four areas, and it's easy to see how each relates to the Hilltop Campus Village. • Design involves how the area looks, and includes projects such as those crosswalks, decorative streetlights, banners, and façade improvements. • Organization is the Hilltop Campus Village structure itself. A strategic plan, Tunnicliff said, is expected to be approved at the board's July meeting. • Promotion can be seen in the two outdoor music festivals and the banners. • Economic restructuring is making the area more friendly to business, which involves everything from inventorying available properties to slowing traffic on Brady and Harrison to encourage people to stop in the Hilltop. Sometimes those areas overlap. For instance, the Hilltop Business Association is funding a program that rebates 50 percent of costs (with a maximum rebate of $5,000) for property improvements - a business incentive that bolsters the neighborhood's appearance. Frantz said that many people are surprised at the intensity of the Main Street process: "Much is going on behind the scenes." The decline of the Hilltop area can be traced most directly to the conversion in the 1970s of Harrison and Brady streets from two-way to one-way traffic. "The unintended consequence was to abandon this corridor for small business, and instead place the emphasis on transportation," Tunnicliff said. "They in essence unintentionally created an Interstate corridor." He said that his vision for the Hilltop Campus Village involves having street parking on both sides of Harrison and Brady within five years, and restoring both streets to two-way traffic within a decade. "Traffic calms, pedestrians are more invited, the businesses along these corridors get more of a look," he said. He called the current traffic flow and speed "barriers to investment" that need to be removed. But he noted that while street parking and two-way streets are his ideal solution, they might prove to be challenging logistically and/or politically. Frantz agreed, saying that he thinks there might be too much neighborhood opposition to return Brady and Harrison to two-way traffic. But he said on-street parking and the conversion of smaller one-ways - such as 14th and 15th streets - could accomplish a lot. "I support anything that's calming," he said, adding that smaller one-ways "don't allow commercial revitalization to occur," because they make it difficult to access businesses. Matt Flynn, senior planning manager for the City of Davenport, wrote that Harrison and Brady street parking has been studied by the city and deemed appropriate, but it would still require city-council and Iowa Department of Transportation approval. "Conversion to two-way [traffic on Brady and Harrison] will obviously need more study, as well as a significant financial commitment from the city," he wrote. "This is unlikely to occur in the short term." Two-way traffic on Harrison and Brady was part of the city's 10-year transportation plan completed in 2010. The Estate Sale Shop's Wallace said she understands that such dramatic change requires patience, especially with Brady and Harrison being state highways. "Big change is very much like the Titanic - it takes a long time to turn," she said. If either street parking or two-way traffic doesn't happen, Tunnicliff said, it's still possible to slow down traffic to the benefit of Hilltop businesses and the safety of pedestrians. "I would say it would make it more difficult; I wouldn't say it makes it impossible," he said. "It may take longer. It may be less intense." Lower speed limits, more-aggressive speed-limit enforcement, and signage, he said, are all tools to slow vehicles. But he stressed that the "optimal" way to decrease speed on those streets is through parking and two-way traffic. Wallace called altering the traffic flow is "crucial. ... It's a racetrack. Two-way traffic would slow that down. ... They drive through the area now" instead of stopping. Traffic on Harrison and Brady is a visible, easily understandable issue to address. But something abstract might be an even larger challenge: perception. When asked about obstacles, Tunnicliff said: "overcoming the perception that's existed for a couple generations now, that investing in an area south of Locust is a risky venture." "When you take any urbanized area that has been neglected and try to renovate it, what you fight is what happened during the neglectful period," Wallace said. "And that neglectful period was there, there's no doubt about it." "It didn't get to the point that is overnight," Main Street Iowa's Poe Buschkamp said. "It's hard to understand that it's an incremental, step-by-step, one-baby-step-at-a-time process where you improve one space, you attract one building, you attract one volunteer, you create one event at a time. As long as it took for an area to deteriorate, it sometimes takes quite a long time for it to improve, as well."